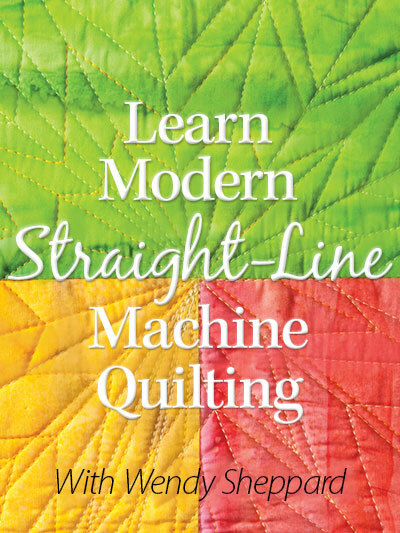 I think as home-machine quilters, “smooth sailing” is one thing we wish for when we “wrestle” and “fight” with our quilts underneath that tiny little throat space of our machines. More often than not, the wrestling causes jerky and not-so-smooth stitches due to the not-so-smooth maneuvering of the quilt! The silicon back of the slider grips to the machine bed nicely. It is easily washable with soap and water. I usually secure it in place with some masking tape after I position it on my machine bed where I want it. When I free-motion quilt, I actually use my right hand to slightly pick up the edge of my quilt to aid the moving done by my left hand. My quilt tends to not “drag” as much as I try to move it. I couldn’t take a picture of both of my hands handling the quilt at the time of writing this post. I will try to get a picture for you for my next Thread Talk post. But use your right hand to give your quilt edge a bit of “pick me up”, you might find moving the quilt just a tad easier and smoother. Thank you for stopping by. I hope these Thread Talk posts have been helpful to you. 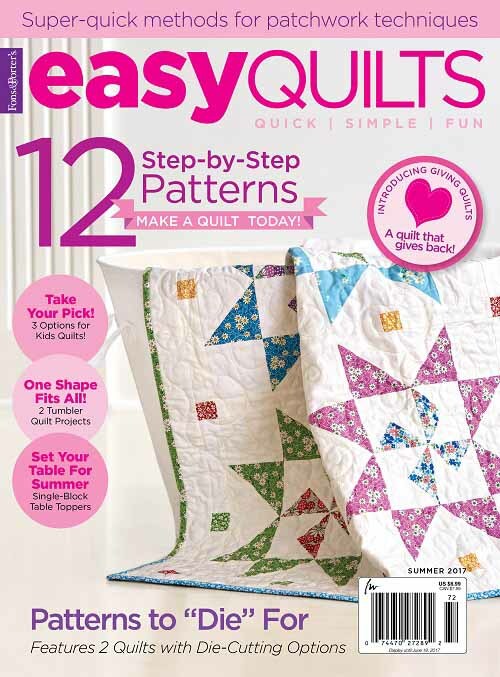 Do leave a comment and share with usyour free-motion quilting experiences! Till next time. UPDATE (8/15/2010): Supreme Slider latest! New sizes are now available for the larger beds for the Bernina 8 series & Janome machines. Sneak peek for the next Thread Talk post: FEATHERS! 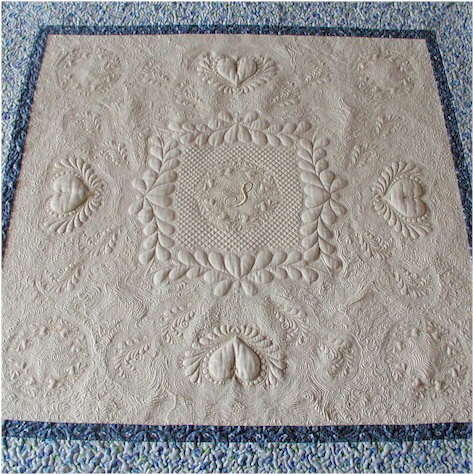 This entry was posted in Freebies, Ideas, Tutorials, Quilting, Thread Talk and tagged Free-motion quilting tips, Supreme Slider. Bookmark the permalink. 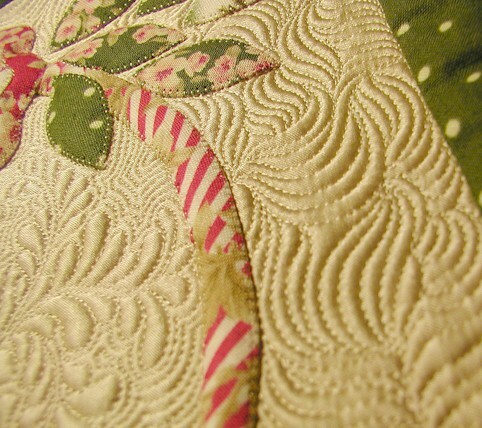 The holding up of the edge with the left hand was something I started doing when quilting Chintz Circles. It did help. I’ve got to look for that Slider thing — I think it would have been a great help too! 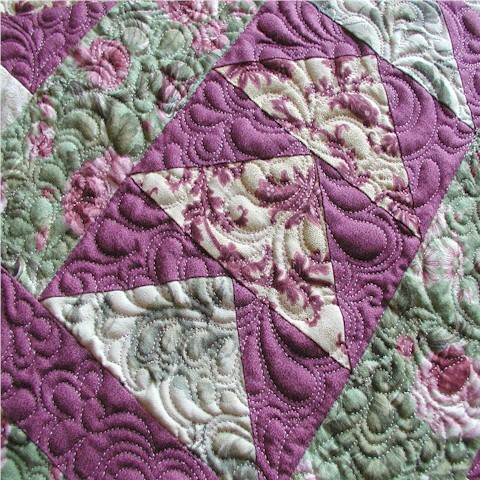 I usually do not do free motion quilting since I prefer to spend my time working with color and scraps. However, I have done some simple work, like stippling. I never drop my feed dogs and it does fine for me. Now, I just bought the slider, but until your post today, I didnt know that I had to drop the feed dogs to use it…nor to tape it down. Thank you for that info. Your work is really stunning, better than for magazines, more like for a museum. Re: Supreme slider not to be used when the feed dog is up. I found that the hole covers up the feed dog area. I suppose if you cut a hole big enough to expose the feed dog. That might still work. I am curious though… if you try it, let me know how it works. It is helpful — but I still don’t know if I could ever do it. It would really be neat if someone could video you quilting. 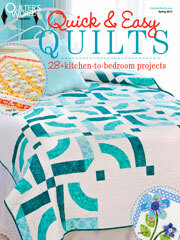 I can’t believe you do all that beautiful quilting on a home machine. It is fantastic! I just don’t have that control. Maybe I’ll try that slider. I admire your work – it’s beautiful!!! 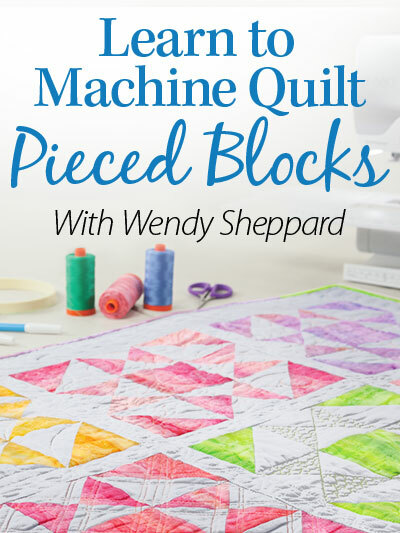 I’m almost ready to quilt my first large quilt 95 x 95 on my domestic machine – so this is a timely post. It will be my second attempt at quilting. Hm – I might have to check into that. I was going to get the Fab-U-Motion but I can’t get comfortable with it. I’ll have to look for this. I’m still trying to work up my courage to try free motion quilting! 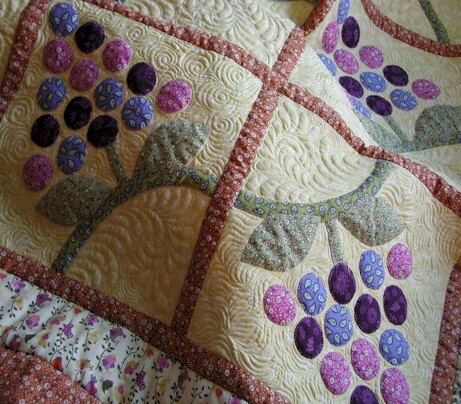 Wonderful quilting, Wendy! I LOVE those grapes , they are just perfect and, of course the Super slider was a good support , but it was you and your hands to create such a beautiful work! Wendy, again, stunning quilting. About how many spools do you estimate to use if using silk on a queen size quilt? Really enjoy your thread talks, Wendy! I have been more of a hand than machine quilter, but lately am doing a lot more on the machine. Your tips are really helpful! Jaw-dropping gorgeous! Awesome work! Love it! You do make it sound and look so easy. I have struggled with it from time to time but need to get back to some practice. Thanks for the tip. Hmmm, I didn’t know about the 820. Is that the same as 830 but no embroidery? I hardly ever embroider anymore anyway. I’ll have to look into that. Hi Wendy, thanks for sharing your tips. I really enjoy your posts. 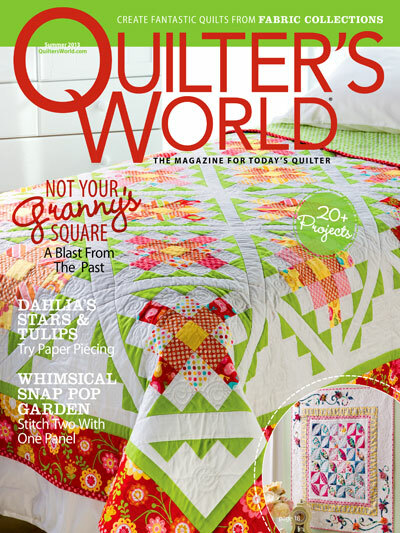 I wanted to ask you where do you start your quilting. In the middle or on the side? I have never seen the slider so I will be on the lookout for it. Unbelievable. I really enjoyed this post. I need my machine quilting to improve. You’re amazing. I’m glad you found me so I could find you. Houston, TX – The Houston Texans signed Andre Johnson to a two-year get gauge on Thursday, a deal that, according to the Houston History, makes him the highest paid encyclopedic receiver in the NFL. The Chronicle reported the extension to be worth $38.5 million, including $13 million guaranteed. On average, Johnson resolution in the present circumstances manufacture $10.5 million per year settled the next seven seasons, not including fulfilment incentives. The University of Miami-Florida issue has dog-tired his thorough seven-year career in Houston after the Texans selected him with the third total pick in the 2003 NFL Draft. Johnson has recorded back-to-back 1,500-yard receiving seasons, including a 101-catch, 1,569-yard effort mould year. He also scored nine touchdowns in 2009 to up his race unconditional to 42 TDs in 102 games. He has caught 587 passes in search 7,948 yards over the indubitably of his calling, no more than two of the numerous club records he owns. Thanks so much for these posts…I’ve always used cotton threads and batting-guess I have a lot to rethink. I often pop in to your website – to drool mainly and get a fix of inspiration. 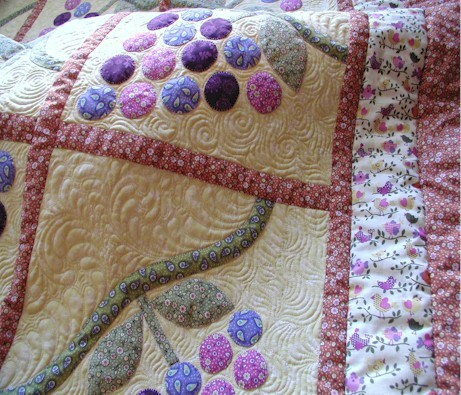 Having just come into Thread Talk for the first time and viewed these most beautifully quilted pieces, I’m feeling very near to tears and absolutely awestruck and the sheer loveliness of your quilting. I wish so much that I could master this but it seems that no matter how hard I try it always looks like a snail with a broken shell has crawled across my efforts. I’m struggling at the moment with the middle section of a quilt that when it’s finally put together will probably weigh a ton (the middle section feels like half a ton already), and I’m a bit worried that when my son and his partner finally get it on their bed, there’s a good chance that they’ll need help getting out of bed – it’ll pin ’em down good. I’m very grateful for your advice about holding the quilt up and will try that tonight. Thank you so much for inspiring me to not give up. I’d like to get and try the Supreme Slider. 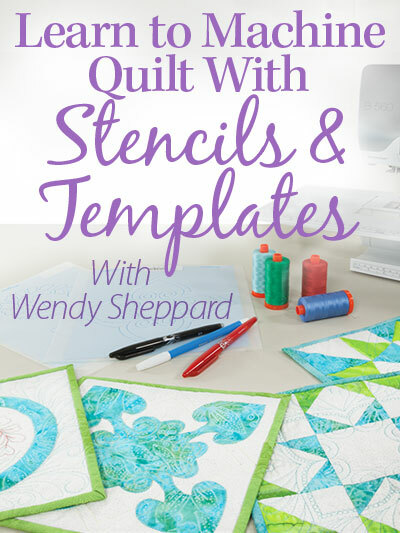 Some machine quilters recommend using vinyl or even parchment paper. Looks like the one you use is more practical. Okay, I’m almost done with the “in the hoop” cheater quilting using my embroidery module, and I’m reading back through all your Thread Talk posts to get ready for the FMQ that I’m going to do around those designs. 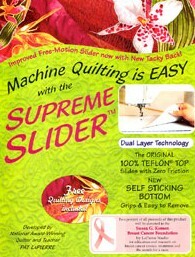 Is this Supreme Slider something that you use every time, with every quilt? Does it really help that much? I would hate to buy ONE MORE THING for my sewing room that I didn’t end up using… Also, which size do you use? I think your sewing machine is the same body size as my 200E/730E. I see on the Supreme Slider site that they have a new, bigger slider that they say is for bigger machines OR for machines that are sunk in a cabinet. My sewing machine is sunk into a cabinet with a surface of Masonite, with one of those clear acrylic inserts filling up the hole around the machine so it’s all one flat surface. Is your machine also sunk into a cabinet like mine? Which size Supreme Slider do you use?